This weekend is shaping up to be a gorgeous weekend in our area. Sunny and cool, perfect autumn weather the likes of which will have us out and about this weekend for a festival and very likely an easy hike somewhere. September is finally at it's end and we usher in October tomorrow morning, so what better send off can we give than the Friday Giveaway Roundup. First up today is the new monthly giveaway at OutdoorInformer.com. 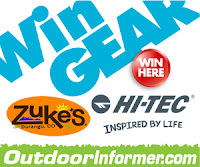 This prize pack includes a nice hoodie and rain parka from Hi-Tec as well as a nice package of treats for your four-legged friend from Zuke's is included. Head over to the giveaway post for all the details and to enter. While you're there, enter one last time for the Salewa and Suunto giveaway. The next giveaway is happening over at SectionHiker.com. Philip recently reviewed the Mountain Hardware Kanza 55 Alpine Pack and is giving one away. All you have to do to enter is leave a comment on the post describing your layering system. You'll have to hurry on this one though, Philip is closing entry to this one at Midnight (EST) tonight. Head on over to the giveaway post and get that comment in. The third item we found up for grabs is over at HikingBoots.com. They are giving away a pair of Timberland Hiking Boots. For the guys they have a pair of Timberland Mountain Athletics Cadion 2.0, and for the ladies a pair of White Ledge Waterproof Hikers. You have until October 10, when they announce the winner to get entered. Just comment on the giveaway post, what your favorite fall hike is and why. So that's it. Today is also the final day to get entered for the Adventure Medical First Aid Kit over at PAHikes.com and to get in on the Garmin Dakota 10 GPS giveaway over at TakeAHikeGPS.com. We hope that everyone has a wonderful and fun filled weekend and we will see you next week.